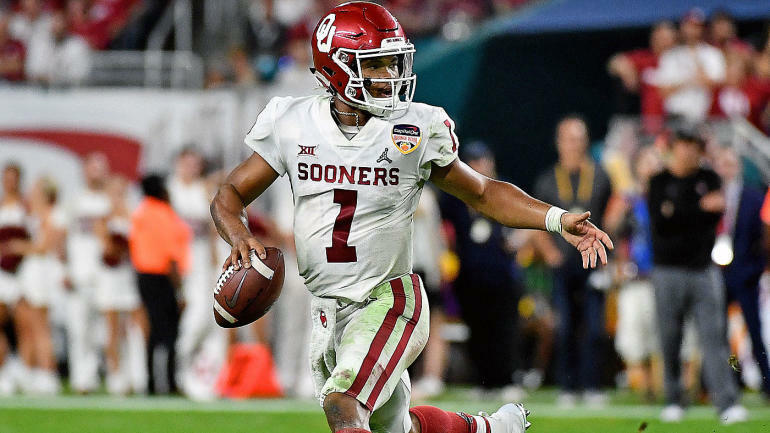 For a few weeks, and maybe even months, the NFL cognoscenti (copyright Hanzus Media) penciled in Kyler Murray to the Cardinals with the No. 1 overall pick in the 2019 NFL Draft. It (sort of) makes sense: Murray is an exceptional athlete with a very high ceiling as a starting quarterback in Kliff Kingsbury’s Air Raid offense and Kingsbury himself praised Murray just a few months ago, noting he would absolutely take him in the first round. But things are starting to shift a little bit in terms of how Murray’s place in the first round hierarchy is viewed. CBS Sports’ Pete Prisco mentioned recently on the Pick Six Podcast — our daily NFL pod, listen to Pete below and subscribe right here! — that he’s hearing the Cardinals could be looking in another direction at the top of the draft. What Pete is hearing out of Arizona is starting to become a more prevalent opinion out there. On Monday, Peter King of NBC Sports wrote that he’s hearing there’s no sure thing about which direction the Cardinals will go. Specifically, King wrote that he doesn’t believe as of Monday “there is unanimity inside the Cardinals building” as to what they want to do, whether it’s stand pat and draft a defensive player, take Kyler and trade Rosen or even trade down. Additionally, Daniel Jeremiah of NFL Media, who has been criss-crossing the country on a pro day tour, said this week that his confidence level in Kyler going No. 1 overall has dropped pretty substantially. Jeremiah still had Murray going No. 1 overall in his latest mock draft that he dropped this week, but that’s not unusual. There are tons of 2019 NFL Mock Drafts out there with Murray first. The Cardinals have made it known they’re willing to consider Murray with the first overall pick and while they’ve publicly endorsed Josh Rosen multiple times, they’re not exactly shying away from embracing the Murray hype. Add Albert Breer of SI.com to the mix as someone who has heard the buzz about Kyler not going first overall, with, as Prisco noted previously, the Cardinals potentially interested in taking Williams out of Alabama. The point being there is legitimate smoke and potentially some fire when it comes to the first overall pick and Arizona going in a non-quarterback direction. In the middle of writing this story, GM Steve Keim held a pre-draft press conference, saying the Cards haven’t decided what they want to do yet with the top pick. How could they have? They haven’t seen all their options and won’t until they’re actually on the clock. The longer you wait, the more things can open up. Could one of those things be a trade up for Murray? Sure. Or their decision, if they go with defense, could open up another team’s interest in trading up for Murray. The Jets, for instance, would love to move down from No. 3 and acquire extra draft picks. One team that may or may not be interested in doing that is the Washington Redskins. We don’t know what they’re doing because Murray is declining to spend any extra time with the Redskins ahead of the draft. According to Steve Wyche of NFL Media, Murray canceled his meeting with Washington set for later this week. The beauty of the NFL draft is this can be taken either way. Maybe Murray is canceling his visit because the Redskins are very interested in him and considering a trade up. Or, more likely, maybe Murray is canceling his visit to let the Redskins know they won’t be able to get him if they just stand pat at No. 15, because he knows he won’t be falling that far. Murray has already visited the New York Giants, who hold picks No. 6 and No. 17. Nothing is a sure thing in the NFL and there’s even less of a sure thing when it comes to the modern NFL draft. Murray could go first overall, he could go 31st overall and nothing should surprise anyone. Especially with the still to-be-determined drama that could unfold at the top of the draft.